Just 3 days until RWBF! You still have a couple days to buy presale tickets for just $30, which get you entry and unlimited sampling at the event from 1-5pm. 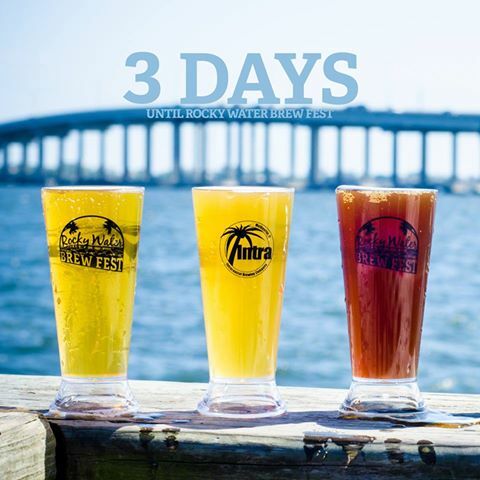 You can purchase your tickets in person at the brewery or online at rockywaterbrewfest.com. The night before, Friday the 4th, there will be a free to the public Brewer’s Welcome Party held at World of Beer in Viera. We would have loved to host as we did in the past, but with Hurricane Matthew passing through we had to rearrange hotel stays, dates, and our expansion at the brewery is underway leaving our typical event venue under construction. We are still open for business, just lacking the ability to host parties for the masses for a few more months. So get those tickets, the weather’s looking beautiful this weekend for Rocky Water! Cheers!